How much flash power do I need? For small studio portraiture, these parameters are fairly known. You should always shoot at the lowest ISO settings available from your camera (typically ISO 100, but some cameras limit you to a minimum ISO of 200). If you are limited to ISO 200, you will need half as much power as ISO 100 cameras. In most small portrait studios, the photographer will want to be able to shoot from one to three or four people at apertures ranging from f4 to f16, using umbrellas and softboxes at distances of two feet to eight feet or so. 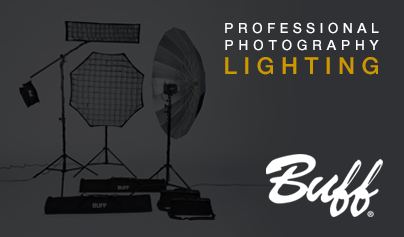 Studio flash units rated from 150 Ws to 300 Ws each (or more) provide ample output for this purpose. It is extremely important that your flash units have a wide adjustability of power levels. A 6 f-stop power variability range (from Full Power to 1/32 power) is ideal. Of course, it is very important to have flash units with accurate modeling lamps so that you can compose your pictures and avoid excessive trial and error. If you are limited to ISO 200, 300 Ws may be too much power because you may have difficulty in lowering the power enough to capture those f4 shots with close placement of the lights - particularly if you have a limited power adjustment range on your lights. If this is the case, you will be forced to move the lights further from the subject than you might prefer, or forced to use other methods such as neutral density filters to reduce the light levels. Some users prefer to use lights with different power levels in such studios (for example a 320 Ws light for main and 160 Ws lights for fill, etc. ), but many find this problematic and prefer to use three or four lights of the same power for easier interchangeability. Our experience is that far more users end up wishing they had bought lower power lights (like the AlienBees™ B400) rather than higher power. The situation changes dramatically when you take your lights on location to shoot larger subjects such as wedding groups, location fashion work, architecture, etc. Here, you may need considerably more power and may often be striving for higher aperture numbers. Most of these applications suggest flash units in the 600 Ws range. If your work regularly spans both small studio and location shots, the versatile 9 f-stop power variability of the Einstein™ would serve your needs well. The White Lightning™ X-Series X1600 units may also be a good option as these units are switchable from 660 Ws to 165 Ws and maintain a 6 f-stop power variability range at either power setting, thus affording an overall range of from Full Power to 1/128 power. Beyond this, when even higher amounts of flashpower are needed, combined with very fast flash durations and recycle times, the Zeus™ series is indicated. Is my camera compatible with the 15' sync cord that comes with the flash unit? Not all cameras have a pc sync terminal which is the standard connection for using external strobes. You can check your camera manual to see if one is included. If your camera does not have a pc sync terminal, there are 2 options for getting around this. One, would be to use a hotshoe adapter(link), or if you prefer to not be tethered with the cord, you can use our CyberSync wireless remote system (link). Click on the list here (link to list David made(? )to see if your camera is compatible with the cable. If you do not see your camera listed and you are still unsure, please feel free to contact customer service. If I am using a multi-light setup, how will the other flash units fire if I only have one connected to my camera? All Paul C. Buff, Inc. flash units have a built-in, light sensitive, optical slave eye. This means that when the main flash, that is connected to your camera, begins to fire, the other flash units will “see” this and fire at the same time. Make sure that the slave eye is active on your unit: The slave eye is active on both the AlienBees™ and White Lightning™ units as long as nothing is plugged into the sync jack on the back panel. The slave eye on the Einstein™ and DigiBee unit’s MUST be turned on and off via the back panel of the units. Plugging into the sync jack will not disable the slave eye on these units. My slave eyes are active on the flash units, but the units are still not firing, why? Slave eyes are most reliable when working in a controlled studio environment. There are many factors that can interfere with the slave eye functions, including the distance in which the flash units are from one another, the output setting of the flash, as well as positioning. Because of this, most photographers prefer to use wireless remotes like those found in our CyberSync™ System that utilize a transmitter on the camera and a receiver on each flash. This ensures that all units are firing via radio frequency and there is no need to rely on the slave eye. My flash unit is rapid firing on it’s own. What is causing this? Many things can cause rapid firing. First, if you are using wireless remotes, check the voltage on your batteries in the transmitter. When the battery begins to lose its charge and the voltage drops, this can cause the flash units with receivers connected to start rapid firing. Installing fresh batteries will eliminate the rapid firing. Plugging into a non grounded AC outlet, or select power strips, may also cause rapid firing. First, try plugging into a different outlet all together. If rapid firing continues and you are using a power strip, try eliminating the power strip. If you continue to have this issue after checking the above, please contact our customer service for technical support. My flash unit is firing intermittently from both the camera and the test button on the back of the flash unit or it is not firing at all from from either. What could be causing this? Make sure that the back panel of the unit’s “OK” or “READY” indicator light is green. If the red dump light is lit and never switches to green, try plugging the unit into a different outlet. If the red dump light still stays on, contact customer service for technical support. If you ARE getting the green “OK” or “READY” light try the steps below. Misfiring could be as simple as a flashtube that has been cracked, or it may not be seated properly in the housing. Occasionally misfiring is a sign the flashtube is about to burn out. First, power off the flash unit, and unplug it from the AC source. Wait approx. 10 minutes to make sure that everything is fully discharged. Wearing a glove, remove the flashtube and inspect for any hairline cracks, etc. A crack in the tube will cause the gases to slowly leak out which will cause misfiring and eventually no firing at all. If the flashtube appears to be fine, reinstall the flashtube in the unit, making sure that you have pressed around all sides to ensure that it is seated well. If it does not eliminate the issue you may need to try a new flashtube or a known working tube. If you have multiple AlienBee™ or White Lightning™ X-series units (regardless of the model) they all take the same flashtube. You can try swapping the tube from a known working unit to see if the problem follows the flashtube. If it does, this is a sure sign that a replacement flashtube is needed. User replaceable flashtubes are available directly through our website. My flash unit is firing fine every time from the test button on the back of the unit, but will not fire (or will not fire every time) when using the 15' sync cord. What could be causing this? If you are using the sync cord to connect from flash to camera, the cord may be bad. To test the cord, simply power the unit on plug one end of the cord into the sync jack on the flash. Then, short the PC connection end by using something metal (such as a nail file, paper clip, etc). To do this, make sure to touch the center pin and outer collar of the PC tip at the same time. Do this multiple times. This should make the unit fire. If it does fire, the sync cord is fine. If it does not fire when shorting the cord, you likely need a new sync cord. You can also test the sync jack on the flash unit. While the flash unit is turned on, plug the sync cable in and out of the sync jack on the flash. The unit should fire both, when inserting the cord, and when removing the cord. If it does not fire, there may be an issue with the sync jack and you will need to contact customer service for support. Can I use a brighter (higher wattage) modeling lamp than the one that arrived with my flash unit? All Paul C. Buff, Inc. flash units arrive with the max wattage modeling light that can be used. Maximum wattage for each unit is as follows: AlienBees™ - 150w White Lightning™ X-Series - 250w Einstein™ - 250w DigiBee - 75w (400w equivalent) LED modeling light that is permanently installed. Can I purchase modeling lights anywhere or must they come from Paul C. Buff, Inc.? Since the AlienBees™ and White Lighting™ units have a standard Edison (household) lamp base, you may purchase replacement bulbs locally. The flash units arrive with a halogen quartz bulb, but you can use any Edison base bulb as long as it does not exceed the max wattage for the unit, it does not touch the flash tube, and it is NOT a compact fluorescent bulb. A fluorescent bulb’s ballast can cause damage to the unit. Einstein™ units take a 250w max 120V quartz bulb with a bayonet style base. These may also be found locally. The modeling light in the DigiBee flash units has a lifespan of 25,000 to 50,000 hours at full power. It should not require replacement for a number of years and is NOT user-replaceable. Please contact our customer service should your modeling light burn out in the DigiBee. Can I use LED bulbs in the AlienBees™, White Lightning™ or Einstein™ units? LED bulbs may be used in AlienBees™ and White Lightning™ units. We recommend the GE “Energy Smart” (11W / 60W equivalent or lower) LED bulb. Please note LED bulbs may not dim accurately with the slider on White Lightning™ units or when in TRACK mode on AlienBees™ units. When choosing an LED for the AlienBees™ or White Lightning™, make sure to find one that sits as far away from the flashtube as possible. Since LED bulbs are made up of a lot of plastic parts, the heat emitted from the flashtube, when firing, may eventually melt those LED parts (especially when fired for long durations of time during one session). Unfortunately, we are not aware of an LED bulb that works properly with the Einstein™ unit at this time. The modeling light in my flash unit flickers randomly, even when I’m not firing. Is there a problem? It could be as simple as the modeling light is not screwed all the way into the socket. Modeling light flickering can also be the result of AC line noise. The circuitry is sensitive to AC line noise that can be caused by things such as large air conditioning units, nearby fluorescent lighting, and/or electronic dimmer circuits. Flickering can also occur when circuits are overloaded (perhaps with a large number of flash units connected to a single circuit). Additionally, flickering can occur when different cables and cords are run too closely together or when excessive extension cords are used. To prevent flickering, be careful not to overload your power circuits. When using a wired remote control, do not route the remote cable in close proximity to power cords. If you use an extension cord that is 25 feet or longer, use a 16-3 or larger gauge wire (3 #16 AWG wires) extension cord. Please note that smaller numbers indicate a larger wire, so a 14-3 extension cord (3 #14 AWG wires) is larger than a 16-3 cord. What is the average current draw of Paul C. Buff, Inc. flash units? Einstein™ units draw an average current of 5 amps, DigiBee units draw an average current of 7 amps, and both AlienBees™ and White Lightning™ flash units draw an average current of 6 amps. This means that if a light were fired every time it recycled, the average current draw would be 5 or 6 amps. At the beginning of each recycle, the lights draw a peak current of about 10 amps (DigiBee units) or 16 to 18 amps (AlienBees™, Einstein™, and White Lightning™ units) for about 200 milliseconds. This is well tolerated by household circuits and breakers. A typical circuit breaker will tolerate three flash units in normal use. When the lights are idle and not being fired, the current draw is essentially that of the modeling lamp - 1 to 2 amps per unit. What is the sync voltage (or trigger voltage) of Paul C. Buff, Inc. flash units? When using digital cameras, it is best to check on the maximum sync voltage allowed for your specific camera to ensure that the amount of voltage present in the sync cord connection will not cause damage to your camera. Some brands of flash units have sync voltages much higher than ours, some as high as 50 - 60V, but the sync voltage on all current Paul C. Buff, Inc. flash units and power packs is under 6 volts and is safe for use with digital cameras. Please note that the sync voltage on some of the older, retired White Lightning™ models was higher: 9.5 volts on the retired Ultra Series units, 12 volts on the retired ZAP 1000 units, and 24 volts or higher on the retired WL5000 and WL10000 units. When using these units with a digital camera, you will want to use a safe sync adapter (such as the Wein Safe-Sync Hot Shoe to Hot Shoe High Voltage Sync Regulator, available from B&H and other similar photo equipment stores) to reduce the voltage to safer, lower levels. Alternately, you could use the CyberSync™ wireless system which eliminates all worry about sync voltage. Can I order a 220V or 230V version of any Paul C. Buff, Inc. flash units? For global plug-and-play flash use, we offer the Einstein™ system. The Einstein™ automatically switches to operate from 95VAC to 265VAC, 50 or 60Hz with no user attention or adjustment required. You will simply need to purchase a standard IEC power cord (available locally at various electronic stores) that fits the wall outlet configuration for your location. The AlienBees™, White Lightning™ and DigiBee are not available in 220V. How can I power my Paul C. Buff, Inc. flash units internationally?